Always keen to support a great cause, Westbury Packaging has recently donated to the Somerset-based School in a Bag initiative. Through a crowdfunding campaign launched by the charity in December, we pledged £1,000 towards the cost of two new desperately needed vehicles which have now been purchased and already put into action. School in a Bag was launched by the Piers Simon Appeal in 2009 and their mission is to give the chance of an education to poor, vulnerable, orphan and disaster affected children throughout the world. Since setting up, they have delivered over 54,000 school bags into 26 different countries, to children who otherwise would have little hope of an education. The school bags are actually vibrant red backpacks and contain stationery, learning resources and eating utensils. In the aftermath of disasters, these bags provide hope to poverty-stricken communities, giving back routine in the form of schooling and providing the children with better opportunities for the future. They also assist with emotional rehabilitation, allowing children to draw or write about their experiences. Recently, School in a Bag have become a nominated charity for the worldwide voluntary service organisation, Inner Wheel. This is great news for School in a Bag who will now be touring the UK & Ireland to promote their work. 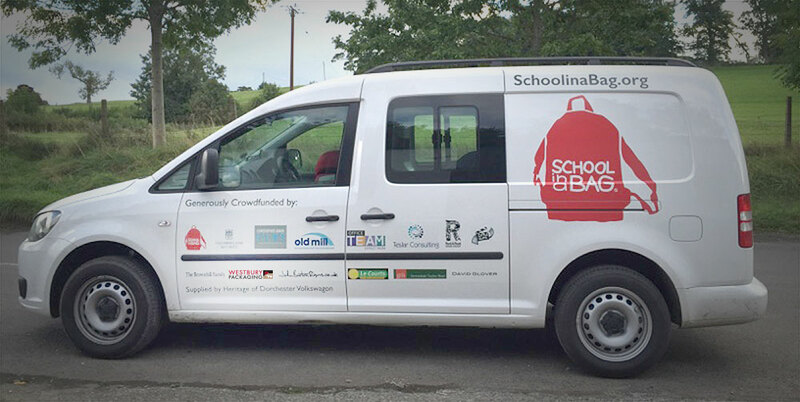 In return for our donation, the Westbury Packaging white horse logo will be galloping across the UK & Ireland too – on the side of School in a Bag’s minibus and VW Caddy Van. So please look out for it and tweet with a photo if you spot it! If you would like to find out more about School in a Bag and their vital work, please visit their website.